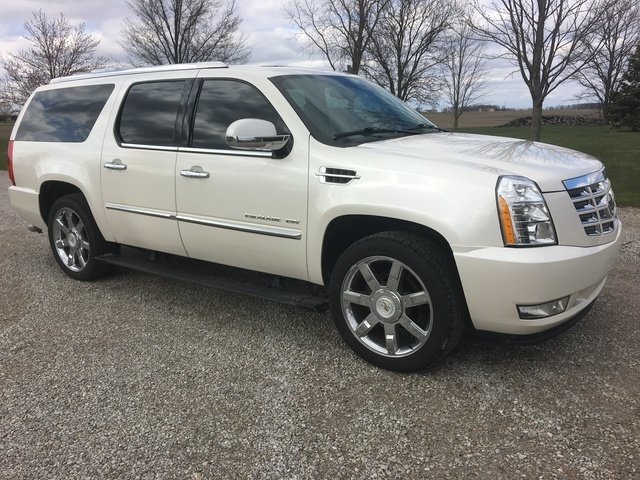 CarGurus has 7,188 nationwide Escalade ESV listings starting at $3,200. Just the name Cadillac summons images of opulence, elegance, power and prestige. 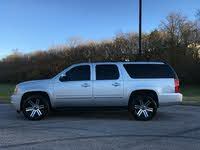 The 2012 Cadillac Escalade ESV certainly won’t disappoint on any of those counts. Oversized and proud of it, this luxury-oriented, extended-length, full-size SUV ensconces up to 8 passengers in three rows of leathered ambiance, boasts 137.4 cubic feet of cargo space with the rear seats folded or removed, and rides like sheer silk on a standard auto-leveling suspension system. Of course, V8 power is standard, along with plenty of creature comforts, chrome and panache. This behemoth is the largest vehicle in the Caddy lineup, some 21 inches longer than the run-of-the-mill Escalade, and is priced accordingly, with the lowest MSRP expected to run close to $70,000, while gas mileage is correspondingly abysmal. Those that are prepared to do a deal on this huge ute, however, will likely not be intimidated by either of these downsides. As in 2011, three trims grace the 2012 Escalade ESV lineup. There’s the Base, which is far from basic, the midlevel Luxury, the upper-crust Premium and the aptly named Platinum Edition. All trims are delivered with standard rear-wheel drive (RWD), but all are available with full-time all-wheel drive (AWD) as well. All trims are equipped with the auto-leveling suspension; however, higher trims are further endowed with GM’s well-wrought Magnetic Ride Suspension, which nicely complements plush ride comfort with surprisingly adept handling characteristics. Again, Lincoln’s Navigator L and GM’s own GMC Yukon Denali should lead the competition, size-wise. The Infiniti QX56, Land Rover LR4 and Mercedes-Benz GL-Class, meanwhile, though marginally smaller, are well matched with the Escalade ESV in posh, price and prestige. Each of the latter is also likely to be better suited to crowded parking lots and the average garage than their hulking peers. The standard powertrain for the 2012 Escalade ESV is once more expected to be the 6.2-liter variable-valve-timed (VVT), Flex Fuel (FFV) V8 engine and 6-speed shiftable automatic transmission. Look for 403 hp and 417 lb-ft of torque from this combo, with the automatic sporting a tow/haul mode and rear locking differential. With the standard tow hitch and wiring, RWD Escalade ESVs will tow some 8,000 pounds, max, while AWD-equipped trims are touted to haul some 7,700 pounds – not bad when the polo ponies absolutely, positively have to be delivered on time. And mileage? Well, look for little better than 14 mpg city/18 highway, 13/18 in AWD trims. Finally, all trims will likely come with a standard auxiliary transmission fluid cooler, and the available full-time AWD system should again be managed by a viscous center limited-slip differential. Exterior brashness and interior plush have always been strong features of the Cadillac brand, and thus it is with the 2012 Escalade ESV. Base trims, for instance, are expected to sport 18-inch alloy wheels, a roof rack, step running boards, power-adjustable, heated, reverse-tilt outside mirrors and a power rear liftgate on the outside, just like last year’s trim. Inside, leather upholstery, heated, power-adjustable front seats, simulated wood and simulated alloy cabin accents, and a steering wheel of leather with wood inserts lather occupants in luxury. Complementing all these should be reclining second-row bucket seats, cruise control, power tilt-wheel steering, a universal remote garage door opener, rear parking sensors, a rear-view camera system, tri-zone climate control and memory for driver’s settings. Techno-gizmos in the Base trim, meantime, are likely to include a standard MP3-capable 6-CD changer with 10 Bose premium speakers, 5.1 surround sound, XM satellite radio, a memory card slot, a USB connection and Bluetooth hands-free phone technology. Of course, GM’s highly touted OnStar Directions and Connections navigation and communications service should also come standard. Moving up to the Escalade ESV Luxury trim ought to once again gain standard 22-inch alloy wheels, heated and cooled front seats, heated second-row seats, a heated steering wheel, power-tilt sunroof, power-folding outside mirrors and the touted Magnetic Ride Control suspension. Meanwhile, the upper-midlevel Premium trim throws in power "tumble n’ fold" second-row seats, remote engine start, rear-seat DVD entertainment, and power-retractable side steps. In choosing the Platinum Edition Escalade ESV, owners can expect a standard driver’s side auto-dimming outside mirror and upgraded leather upholstery as well as unique wood and aluminum accents, with heated and cooled cupholders all around. With such luxury appointments standard throughout the lineup, options for the 2012 Escalade ESV are limited. Rear-seat DVD entertainment is available for the Luxury trim and, with available second-row bench seats, passenger capacity is increased to 8 for all trims except the Platinum Edition. Standard safety equipment across the 2012 ESV lineup should include 4-wheel antilock brakes (ABS), traction and stability control, front side-mounted airbags and three-row head airbags, just for starters. Then there are front fog/driving lights, daytime running lights, turn-signal-integrated outside mirrors, a remote antitheft alarm and a post-collision safety system once more expected to be delivered with each trim. Additionally, OnStar Emergency Service, including Airbag Deployment Notification and Stolen Vehicle Tracking, among other things, should once more be standard throughout the ESV lineup. The Luxury and higher trims also receive a standard blind-spot warning system, while the Platinum Edition is again expected to be delivered with standard LED headlights. Owners of the 2011 Escalade ESV cite its gas mileage and hefty base price as their pet peeves. Most concede, however, that standard luxury appointments, cabin ambiance, interior passenger and cargo space, and out and out power, as well as the fact that it’s a Cadillac, overcome any trepidations regarding cost. What's your take on the 2012 Cadillac Escalade ESV? 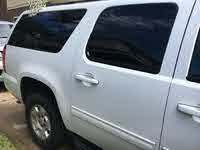 Have you driven a 2012 Cadillac Escalade ESV?